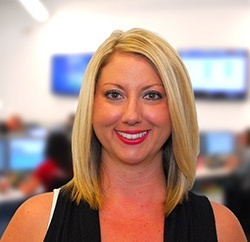 This week we're showcasing new Mortgage Technical Support Specialist, Jessica Schwab. Jessica started here at Mortech in July, and lives in Lincoln with her husband, Mike. Favorite things to do on her days off: I love to spend time with my family and friends. I enjoy shopping at local boutiques and grabbing a coffee with friends in my free time. Favorite place to travel: Nashville, Tennessee. Favorite time of the year: Summer. What made her want to work at Mortech: I wanted to work for a company that allowed me to continue to learn and grow. I had been in the medical field for the past eight years and saw very little opportunity to grow in the position that I was in. I really enjoy learning and also collaborating with people on new ideas, and after speaking with many people prior to being hired I knew that I would have the opportunity for so much more here! One interesting fact about her: I owned a business with my best friend for two years. We made kids clothes and accessories, crafts, and home décor. We attended many craft, vendor fairs, and farmer’s markets to sell our products. The best part is we are still best friends! Last time we showcased Account Manager Rebecca Zoz, which you can read here. Or to learn more about Marksman, Mortech's mortgage pricing engine, you can click here.